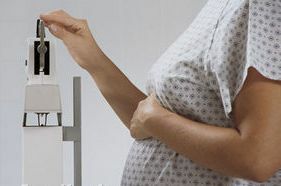 New guidelines on recommended weight gain during pregnancy have been released by the Institute of Medicine (IOM); one important new point is that these guidelines begin before women fall pregnant. The IOM suggest that women should be at a healthy weight before attempting to fall pregnant. If a woman is overweight or obese, it is recommended that she undergo preconception counseling to discuss weight, diet and exercise and to lose unnecessary weight before falling pregnant. Upon falling pregnant the woman is to keep her weight gain within the guidelines and to keep within her before pregnancy BMI. The Guidelines during pregnancy for a woman who is underweight, it is suggested that she gain between 28-40 pounds, a woman with a normal weight range her weight gain is between 25-35 pounds and if a woman is overweight she should only gain 15-25 pounds. A normal weight woman only needs to consume an extra 300 calories per day in order for a healthy pregnancy and infant. A healthy balanced diet is recommended by Dr Melissa Goist, and that women should keep away from the candy bars, she explains that women still are not understanding that pregnancy is not the time to throw good eating habits away, as well as not feasting on carbohydrates and sweet foods. Dr Goist explains that women who are pregnant do not need to be ‘eating for two’. Talking to patients about weight can be a tough subject to broach as the women are already emotional due to elevated hormone levels. Dr Goist is a clinical assistant professor of obstetrics at the Ohio State University medical centre. Previous articleHow To Live With Your Emotions After You Have Had A Miscarriage?